If you are filling your child’s Easter basket, search for Easter gift ideas that will last. Shop wisely for your children’s toys. After all, if you’ve ever tried to clear out toys from your house, you know how hard it can be! By carefully selecting the Easter gifts, you can find toys that will last longer and be more useful to your children. To help with your Easter shopping, I am sharing the latest and most exciting gifts for the holiday. 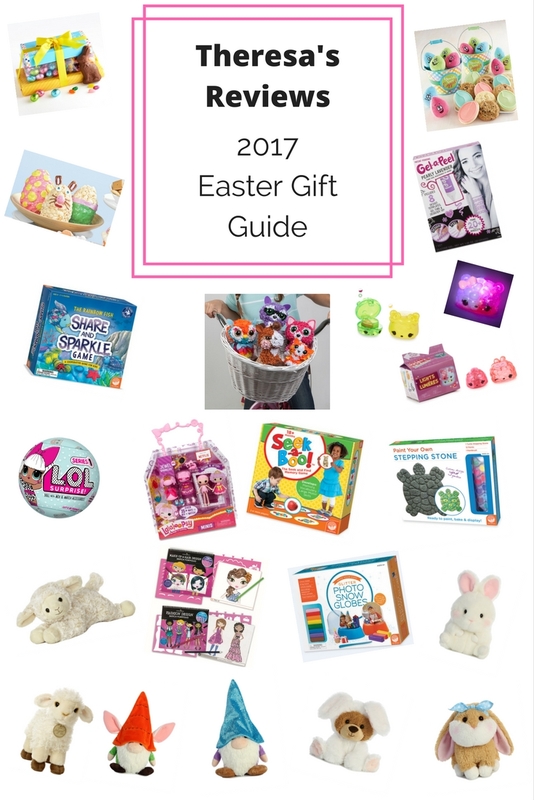 For Easter shopping inspiration, today Theresa’s Reviews features a roundup of top Easter basket gift ideas. Whether you are looking for delicious, chocolatey treats or adorable toys, these gift ideas include something for everyone. Below, you can check out the brand new Youtube video I put together to share these gifts with you. Press play for detailed information about each gift idea as well as my thoughts about each one! Next, I’m sharing some details about each item as well as a product link. As I mentioned in the video, my children are going to love these gifts. On my Instagram page, I will be sharing pictures of my children using the products after Easter. Feel free to click through the product links below and make purchases for your Easter basket! With Gel-a-Peel Starter Kits, girls will enjoy making their own accessories. You can design the style you like, and then actually wear it! For children who enjoy wearing jewelry, the idea of making your own design is appealing. Since the gel is simple to work with, it can be easier than using beads and other jewelry making supplies. For another artistic gift, buy the Fashion and Hair Design Sketch Portfolios with Colored Pencils. This MindWare exclusive product is a creative way for children to play with fashion, hair, and makeup styles without changing anything about themselves. With colored pencils and stencils, children can be as fashion-forward as they would like, without making a permanent change in their look! Another gift children will enjoy is the Paint Your Own Stepping Stone Turtle from Mindware. Since you can paint as intricate of a design as you would like, it is ideal for children who will get into the artistic process. With supplies that are easy to use, children will get excited to make a special stepping stone for the yard or garden. From Orb Factory, Plushcraft toys encourage children to make their own animal pals using fabric crafting. Creating a toy allows children to express themselves. Designed for children to be able to make easily, these toys use simple crafting tools. You can introduce the basic skills needed for sewing and knitting, while letting children work on a level of difficulty that makes them comfortable. Another Orb Factory product is Fluffables. If you are looking for a craft toy that offers customizable looks, this product is ideal. Children will enjoy deciding which accessories their toy should wear and how to do its hair. Since you don’t know what type of accessory your Fluffable comes with until you open the box, the surprise will add to the excitement of the gift. When you are shopping for younger children, collectables and crafts are popular. One of the most popular is Num Noms. From the Num Noms Lights Series 1 Mystery Packs that light up to the Num Noms Series 3 Mystery Packs, which are scented lip gloss that also works as pencil toppers, children will have fun opening up the mystery packs to discover what kind of Num Nom they got. If you have jumbo-sized Easter eggs, you could put the Num Noms inside the Easter eggs for an extra surprise. With L.O.L. Surprise! Series 1 toys, children get seven layers of surprise. Taking apart each layer, you discover new features of the doll. One doll might change color in cold water, while another would cry when you feed her. I can’t wait to do an unboxing of the crate I received to discover what each ball has inside it. For an Easter basked-sized gift, check out Lalaloopsy Minis. With these Style and Swap princess toys, you can change the outfit, accessories, and hair style of your miniature doll. I received Jewel Sparkles as well as Crumbs Sugar Cookie, and I thought they both looked adorable! With the Make Your Own Glitter Snow Globe, children can create their own unique photo snow globe. You can design an Easter-themed snow globe with a picture of your special weekend together, or whatever type of design you would like to make! Since each kit comes with two snow globes, it works well for siblings too. Whether you are shopping for a toddler or a preschooler, simple board games can entertain children and encourage family bonding. With the Rainbow Fish Share and Sparkle Cooperative Game, children learn social skills, such as sharing, while also learning about colors and numbers. The game would go well with the Rainbow Fish book, too! Another fun gift for early learners is Seek-a-Boo. With simple prompts, not only do children work on vocabulary and memory skills, but they also learn to take turns and pronounce words. With this board game, you can make learning fun for your early learner. Children look forward to a sweet, delicious treat in their Easter basket. From Cheryl’s Cookies, not only do the cookies taste amazing, but some come with fun games. As an example, the You’ve Been Egged Activity Pails comes with half a dozen plush eggs as well as tasty cookies. The plush eggs can lead to fun entertainment on Easter Day. Another delicious treat is the Fannie May Easter Quartet Tower. If you want an impressive display of classic Easter treats, this is a fabulous choice. In addition to a delicious milk chocolate bunny, you get jelly eggs and more. This is a great selection if you want a candy gift, but can’t choose which kind to get. For a hands-on activity on Easter, buy the Flavored Popcorn Egg Decorating Kit from The Popcorn Factory. Create an adorable Easter character on your popcorn egg, and then enjoy eating it! With eight popcorn eggs, you have plenty for a family and some friends, too! Having stuffed animals in the Easter basket is a tradition in our home. Even though we have tons of stuffed animals already, it’s nice to update the ones we keep and to occasionally part with the ones that look more worn. In my Easter Gift Guide video above, I shared the Sangar Gnomlin 7.5,” the Carrot Top Gnomlin 11,” the Lil Benny Bunny 9,”Dafney 8,” Rolly Pets Bunbun Bunny 5,” Sweet Cream Lamb 12,” and the Baby Lamb 7”. I have given my children plush toys from Aurora for years, and the toys always stay in excellent condition long after the holiday. Enter to win two PlushCraft products from Orb Factory and the Paint Your Own Stepping Stone craft set from Mindware! To enter, simply complete the steps in the Rafflecopter widget below. To remind yourself to come back and shop this list, Pin the graphic below. Use the share buttons below the article to share this with your friends. What’s in your children’s Easter basket this year? Share in the comments! There are so many great ideas here for gifts. I love giving stuff they can make or do and stuff they can enjoy again and again. Thanks so much for sharing!!! I get books mainly for the kids baskets. What fun products for Easter. Our baskets mostly held candy and books. This is quite the haul! There are so many cool things out there for Easter now! My kids get way more than I did as a kid. But, there’s just so much cute stuff – can’t resist! So many cool ideas. My son is too old for Easter gifts anymore. I love this roundup of ideas for making Easter fun. My kids aren’t overly big on celebrating Easter with big gifts and things. These gift guides are quite awesome. I love that you classified according to age group. It’s really nice to prepare something for the kids. Oh I love how you split this up by age groups! This makes it so easy to decide what items I should get!! we’ve been struggling with Easter gift ideas this year but these are fab! Great giveaway to! I love these suggestions. The paint your own stepping stone is something my kids would love! We are an art focused family, so holidays tend to have lots of artistic items. All of these products look awesome! I need to start shopping for my 1 year old’s Easter basket. This gives me some great ideas for sure! So many fun ideas for kids. I love the no candy options as well since who needs more candy and it’s nice to give something that lasts longer and can be used again and again. So far I have some book about Easter and a few little odds and ends I’ve been collecting like jewelry and coloring books. I want to get some crafts for my older Granddaughter and candy and a stuffed toy for my young Grandson. Thanks for your review on all the goodies. It really helps when deciding what to purchase. Those gnomes are so cute. I always wanted a garden gnome, even though I don’t have a garden. It’s amazing how many things there are to chose from for Easter. kids toys are so interesting. That’s lots of options. I don’t generally buy for easter, so treats are more the thing I like. The You’ve Been Egged Activity Pails are pretty awesome. So many great ideas here. I always struggle with Easter, I don’t want to go overly lavish and I try to keep the true meaning of Easter alive. It can really be a challenge. These are all great ideas for Easter baskets. We usually stick to just one item, a book, and maybe a movie. These are all great Easter basket ideas! My stepdaughter loves turtles so I am definitely getting the stepping stone! I haven’t shopped yet for their easter baskets! I need to pick out some of the things you mentioned! I like the gel peel stick thingies! Very cool! I love how you broke it down by age group because having kids of different ages, I feel like its hard sometimes to pick the right items. So many great Easter basket ideas here. My 3 year old pointed out Num Noms in the store the other weekend and asked for some. I may include them in his basket this year! Great gift giving guide! 🙂 We love surprise toys! Or blind packs. We have been into the mini trolls blind packs and the lego batman mini figure ones here. Oh my, Easter is coming soon! Time flies! I like the age decision you’ve made here because it could assist parents to choose which gift is best for their kids. I love all fo this. All such great ideas. I need to start planning and getting all my kiddos things in order. It’s coming up pretty quickly! Great round-up of gifts ideas for Easter. I haven’t heard of many of these. I love the nom nom lipgloss that turns into a pencil topper. Sounds right up my daughter’s alley. Thanks for suggestions! This is such a perfect round-up! I tend not to give/get very many gifts (a small basket) since we want to focus on the actual reason we’re celebrating Easter! Some really great gifts for children for Easter! It’s handy how you’ve split it up into age groups. Great giveaway too. This is such an outstanding Easter Gift Guide. I love that you broke it down by age which is mega helpful. That’s a very comprehensive list. I love how you broke it down by age group. Not all Easter gifts are appropriate for all age groups. What a great gift guide! I have two daughters – age two and eight so we are at very different age groups when it comes to buying gifts! All these ideas are great! I love that you have them broken into different age groups. That makes it so easy. Such a perfect list by age group! I think my kids will enjoy the painted stepping stone turtle! This little guide was awesome. So many great ideas. I have 3 little ones and have been trying to figure out what we want to do for Easter gifts. This was a great find! If I had something like the Fashion and Hair Design Sketch Portfolios with Colored Pencils when I was younger, I would have been over the moon. I love Easter basket ideas that go beyond candy. I usually put little fun things into my nephew’s gift basket. Such great ideas!! My daughter loves stuffed animals and any of those little mini figurine toys. She never gets tired of receiving them and I will probably buy more!! Of course a bit of chocolate is a must!! Those are some great options!!! Much better than overloading on unhealthy snacks and much more fun as they will last longer!!! This is such an awesome basket with so many different types of goodies. The best part is that it has something for every age group. What a cute gift idea!! Love how you broke it down into different age groups! I love this video! When I was little, my parents would always give the best Easter gifts! I’ll keep these ideas in mind when I have kids of my own! I love this! Sometimes the ones from the store are so “lame” and so expensive! It’s nice to give gift baskets that are actually useful- especially because I LOVE gift baskets! Jelly Beans, Shopkins, a picture book, and a chocolate bunny will be in my child’s Easter basket this year. Thanks for sharing these great gift ideas. You may also be interested in taking a look at HuggyBox. My eleven year old daughter invented the ECO friendly product as a gift to keep families and loved ones connected. Could be a great gift idea for Easter as well. You can take a look at it as http://www.huggybox.com.